« Best Roulette Bets – What Makes The Casinos Worried? Sometimes you want a little bit of history with your gambling. An elegant casino can be new, but there is something special about a casino from yesteryear. The Baden Baden Casino is the oldest casino in Germany. Don’t worry though, it’s held up pretty well and even if you don’t enjoy gambling you can learn something about the place by taking the Baden Baden casino tour which is often available in the tourist season. The town of Baden-Baden, Germany, is a very historic bathing town. In fact, people have come to these springs, or baths, for over 2,000 years. In fact, even the word baden translates to bath or bathe. The Roman emperor Caracalla was known to bathe in Baden-Baden. This history has been channeled into our present as a lovely casino. Visiting the Casino Baden-Baden is like stepping back into elegant yesterdays of Germany, while keeping the important amenities of today. Royalty used to gamble here, and you will feel like royalty as you gamble now. It’s definitely a long way from the world of playing online roulette and I have to say I’d play here over a computer any day! What Can you Play at the Baden Baden Casino ? The Casino Baden-Baden offers all of the classic games that you are accustomed to playing at casinos. You can try your luck as the wheel spins with roulette. With European roulette wheels and the advantages of rules like En Prison then the games offer some of the lowest house edge in the world. Which will obviously increase your chances of winning. This game lends itself very nicely to the classic casino. You will feel like a movie star as you bet it all on black, or perhaps red after some serious gourmet dining at the Baden Baden Casino restaurant which has a fantastic reputation too. Of course, remember the town is also famous for it’s water treatments and the renowned Baden Baden Spa. You can also play a rousing game of black jack. With a higher success rate than other games, black jack will let you go for 21 again and again. This is a calm game to play as you absorb your surroundings. It usually all comes down to poker in a place like this. A real gamblers game, poker has been delighting people for quite a while. Even when you’re losing your money at this game, you will still be enjoying your surroundings. You can’t play poker at a place much better than this. To give you an idea of the size of the casino, there are 138 gaming machines. These include slot machines. Slot machines are the easiest form of gambling. You just wait for the spinning wheels to stop. Sometimes you win, and sometimes you don’t. The slot machines at the Casino Baden-Baden have payout rates between 92% and 97%. So, it’ll take you a little while to lose all your money on the slots. There casino also offers fine dining. As you can imagine, the restaurants are very fancy. The Baden Baden casino dress code is fairly strict and does requires a tie and jacket for gentlemen’s entry. So, this is all very luxurious. 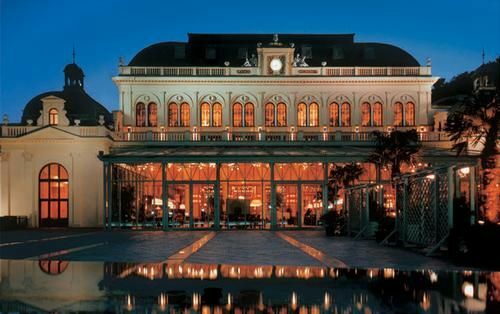 You will enjoy the historic elegance of the casino, paired with the delicious taste of the food. The menu is pretty thorough, and the portions are generous. The casino also provides guided tours. Remember, this is a historic place. I recommend taking a tour. Then, as you gamble with your friends, you can point out things that you learned on the tour. Also, it will help you appreciate the history of the Baden Baden Casino. The Casino Baden-Baden draws in people from all across the world. In ancient times people used to come from far away to bathe in Baden-Baden. Now they come for the gambling. There are other places to gamble in Baden-Baden, but none are as historically relevant.